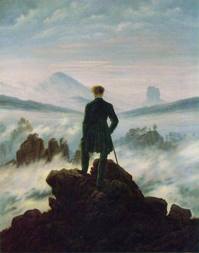 Wanderer above the Sea of Fog (1818). 94.8 × 74.8 cm, Kunsthalle Hamburg. This well-known and especially Romantic masterpiece was described by the writer John Lewis Gaddis as leaving a contradictory impression, "suggesting at once mastery over a landscape and the insignificance of the individual within it. We see no face, so it's impossible to know whether the prospect facing the young man is exhilarating, or terrifying, or both."